How to Grow Chives - Grow This! Chives are a flowering herb known for their mild, onion flavor. They are a preferred ornamental plant for many gardeners thanks to their beautiful purple buds. In fact, the buds are edible as well as the stems, which are more commonly eaten. Here are some tips on how to grow chives successfully in your home garden. Onion chives and garlic chives are grown under the same conditions. Onion chives have the typical chive flavor and purple flowers. Garlic chives produce a mild garlic flavor and white blossoms. Plant chive seeds indoors 8-10 weeks prior the last frost of winter. Transplant seedlings outdoors or direct sow seeds outside after the danger of frost has passed. The ideal temperature for growing chives is 60° F – 70° F.
Chives are hardy perennials in zones 3-10. In cooler climates, grow them as annuals. Plant them in the full sun or partial shade if you live in the south or southwest. Chives can quickly take over a garden, so it’s best to give them their own enclosed bed or grow them in large containers. They’ll grow to 1 – 2 feet tall. Chives companion plant well with carrots. Chives grow best in sandy or loamy soil. They’ll grow in poor soil or thick clay too, but not very quickly. For best results, amend your garden soil with a thick layer of mature compost prior to planting. 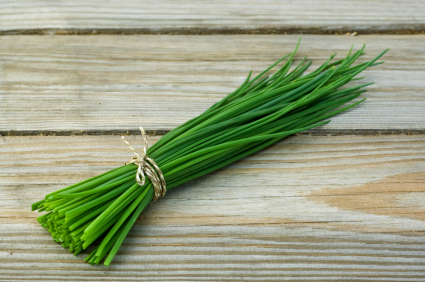 Test the soil pH; chives do best at 6.0 – 7.0. Sow chive seeds 2-3 inches deep in moist, fertile soil. Keep them spaced about 8 inches apart or thin to this spacing once they reach about 3 inches high. Set out indoor-grown transplants a couple weeks after the last frost. Water chives until they become well established. After that, they require little care. Give them a good soak during dry, hot periods. They don’t need much attention, but a little water and occasional feeding of fish emulsion or another nitrogen-based organic fertilizer will make them thrive. A thick layer of organic mulch helps keep weeds down and will maintain good moisture levels in the soil. Watch out for aphids. Pick them off by hand, blast them with a hose or use insecticidal soap if they become a nuisance. Chives may be harvested about 6 weeks after sprouting or as soon as they grow large enough again subsequent springs. Cut them off ½ inch above the soil line. This will leave enough plant to regrow. Clip leaves of garlic chives as needed. When chives go to flower, they can spread seed all over your garden and take over rapidly the following season. Remove the buds or harvest all the chives as soon as they bolt. Divide chive plants every 3-4 years. Freeze chives for storage. Dried chives will have a diminished flavor. For fast growth, plant chives in rich soil, feed with compost tea or fish emulsion and provide plenty of moisture and sun. Let a few plants bloom to allow growth the following year without replanting. You can also plant rooted clumps if seeds are not available.